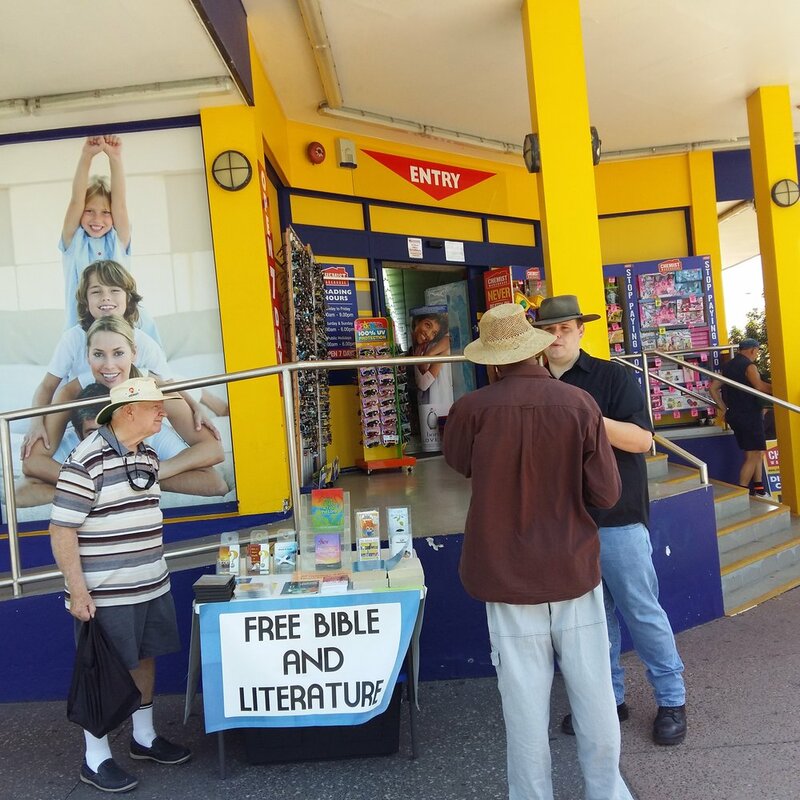 Many people throughout the day were happy to take tracts, but stopping to chat in the heat was not something many people wanted to do; yet despite all that, we were still able to have a good couple of hours of evangelism in Redcliffe. We set up the Bible Table, which usually results in numerous people stopping to browse the free resources, but today only one man stopped. We even had the flip-chart set up, but again no one really wanted to engage. However, we were able to engage in a few short conversations. One such discussion was with two ladies who had some kind of religious background; one of them said she had attended a Baptist church in the past. We spoke about God’s Moral Law, and before I could say too much both ladies said, “We’ve broken God’s Law. We aren’t good people.” One of them said, “But, I will keep trying, as near enough is good enough, right?” I quickly informed here that near enough was no where near good enough. This seemed to shock her, so I used the Christmas season to briefly tell her of Jesus, the rescuer who came to save those who are not ‘good enough.’ Both ladies took a tract and thanked us for the short conversation. Towards the end of our time on the streets, John stopped at the Bible Table. At first Hanna engaged him discussion, but she called me in to talk to him also. This man had a very odd view of religion. He believed that in essence Islam and Christianity all taught the same things. I engaged him in a brief apologetic to show the differences between an Islamic understanding of God and the Christian one. The conversation then went into the area of justice, and how could a loving God punish evil for eternity. He also wanted to know why justice was not served now. I spoke about how God has given the role of temporal justice to the government, but eternal justice is in the hands of God. I also explained to him that all sin is primarily towards God, and thus we face an eternal punishment. John still objected to the idea of God’s justice, so I asked him, “John, do you think murders should be judged by God?” He said they should. “What about rapists?” Again he said God should judge them. “John, how about thieves, what should God do to them?” John without a pause again affirmed that God must punish these evil workers. But then I said, “John, should God judge liars?” This time there was a pause, and then the answer came back in the negative. Now I asked a very pointed question, “John, is that because you tell lies?” He said he had told a few lies, but it wasn’t that big of deal. This once again put the conversation back on the point that all our sin is against God. I answered his objection by saying, “What is wrong with being extreme?” He had no answer. I followed up, “The question you need to answer is, is what I am saying true or not?” John once again went on a tirade about extremism. Upon hearing this John said he would read the Bible, shook my hand and took a tract. His attitude was completely different as he left. Please pray for all those we encountered today. May the Father draw them to the Son.